This past Sunday, June 17, was not just Father’s Day, but also Kennywood Comicon. Yep, a comicon was held in an amusement park. It was pretty cool, not gonna lie. The way the show was set up this year, though, had the artists situated in a picnic pavilion tucked behind the elephant ear booth. It was great to get shade and the occasional breeze. However, we were just tucked away enough that cosplayers by the lagoon had to direct traffic back to us. Which, holy banana pants, kudos to those cosplayers. It was sunny, humid, and over 90 degrees, and the cosplayers were in full Star Wars and Spiderman/Deadpool get-up. How they did NOT die is a testament to how well con staff treats folks. I also need to give a big shout-out to my comics buddy and patron on Patreon, Dave. He helped cover for food and helped me carry my con gear back to my car at the end of the day. Thank you so much, Dave! On the upside, sales from Kennywood Comicon DID help make up for the loss I took from Put-N-Play the weekend before. The downside is, not by a whole lot. That’s partially why I have commission pre-orders open. For folks who are attending my next show on June 24, Feminist Zine Fest Pittsburgh, I’ll draw a black-and-white, full-body commission of a character of your choice for $25. You just need to email me (kelci@kelcidcrawford.com) to get started. If you’re on my email list, you already know all about this, because I just sent an email out yesterday announcing this pre-order sale. There’s also a couple of appearances I’m set to do on June 23, the day before the zine fest! Appearance #1 is Punk, Comics, and Feminism: A Discussion Group at The Big Idea Bookstore at 5 pm. It’s free for everybody to attend. Appearance #2, at 7 pm that same day, I’m doing a live reading of my comic Johnson & Sir at the Feminist Zine Fest Pittsburgh Zine Reading. That will be at the Irma Freeman Center, also free to attend. I hope to see you in at least one of these appearances! a) just like last year, this fell on the same day as a marathon happening in downtown. So my usual route to get to the YWCA was closed off. Oops. 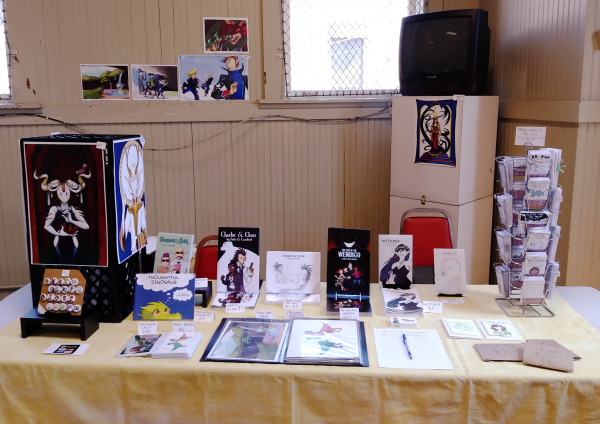 b) there was AC, but the room we were set up to sell our wares in was large and didn’t circulate the air. c) I had wall space! I took full advantage of that wall space to hang up my clearance prints. I sold way more comics than prints, BUT I did sell two clearance prints. THAT helped. In fact, a lot of my clearance stuff got sold out at this show. Thank you, peeps who bought those! You helped clear the way for new art and comics in the future. If you’re interested in any clearance or limited edition things, here’s a link to my Storenvy shop. 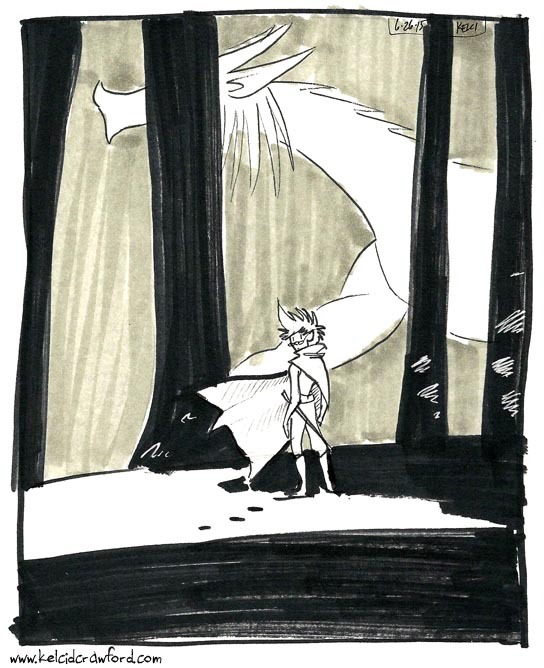 There’s TWO “Jamie and the Dragon” miniprints left! 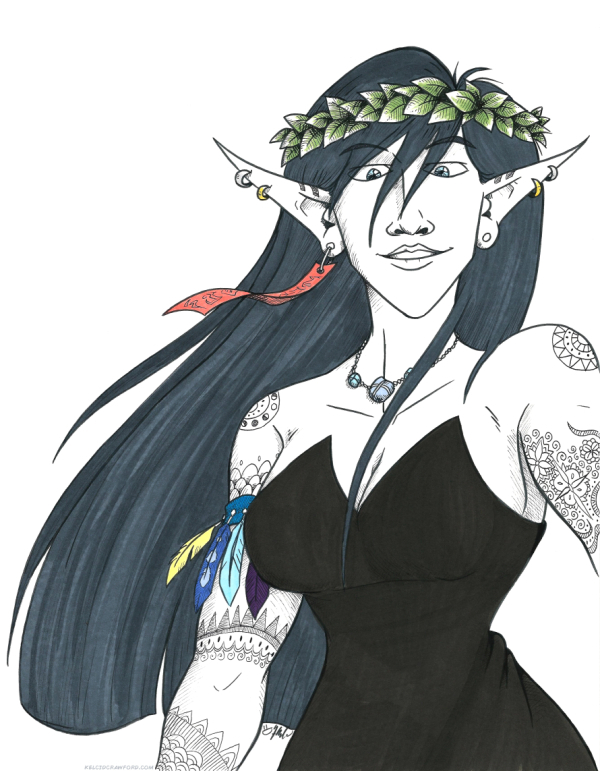 And FOUR “Faerie Queen” left! Back to the show, it was great to be there once more. Seeing all my repeat fans, getting to know peeps better, chatting with the pagans in attendance (Wheeling has a surprisingly large pagan contingent in the city). It was all fun! By the end of the day, it was the most profitable one-day show I had done thus far. In fact, I made more than I made at last year’s show! I think the clearance items helped. So did having two new books and some new zines. And now, I’m going to rest before I restock and prep for the next show. I am, as the French would say, le pooped. My next show is not until June 8 through 10, at Put-N-Play at Put-N-Bay. I have never been to this con. I’m only going because my buddy and Dance Around the Maypole collaborator Chloe talked me into it. Wish me luck! P.S. River City Comic Con got cancelled. The organizer has fallen into ill health. Be sure to wish him well on the River City Facebook Page! So…Many…Puns… But it was so worth it! I almost didn’t go this year because RathaCon was the same day as the first day of Ohio Valley Pride in Wheeling. However, the RathaCon table was booked by the time I found out Ohio Valley Pride was happening, and I didn’t want to back out of my commitment because I know my fans down in Athens would have missed me. I’m glad I went, though, because this was the most financially successful RathaCon I have attended so far! I think it helps, too, that my table buddy this year and I had a good chemistry – our jokes seemed to entertain the attendees, at the very least! 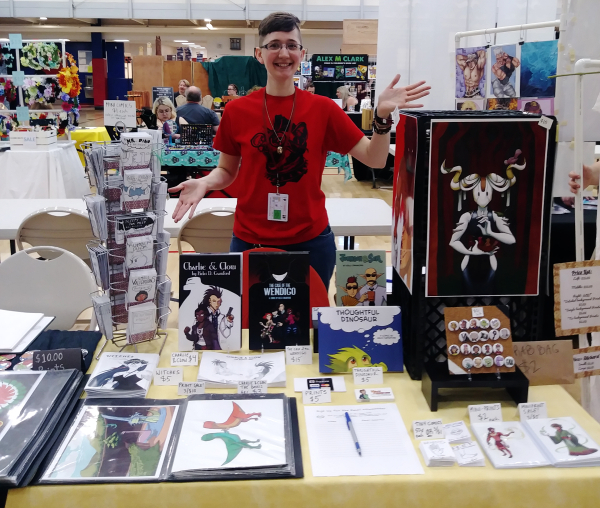 Yes, I had a table buddy at this year’s RathaCon – she goes by the online handle of Arcanineryu and this was her first selling-at-a-convention experience. I think she did great! In fact, we both had REALLY good sales. One element that I think helped the most with that was the RathaQuest the convention organizers ran. The RathaQuest was REALLY fun and I hope the organizers do it again next year. There were some artists that felt the convention should have been had when the school year was open, because Athens is a college town (Ohio University is there). However, I feel a bit differently about it: see, when I was in college at Bowling Green State University, the anime club hosted a one-day convention called Animarathon. It’s a convention still held annually. The problem is this: yes, attendance will grow enormously. Your sales will not. Because college students are notoriously broke. By the way, my next convention appearance is this weekend at 3 Rivers Comicon, May 19 and 20 in West Mifflin, PA. It’ll be at the Century III Mall. There’s free parking and food trucks, if that further entices you. And yes, I will be sharing a table with someone at this show, too, this time with Kampie from Classic Plastics earlier this year. I’m excited to be sharing a table with Kampie again! 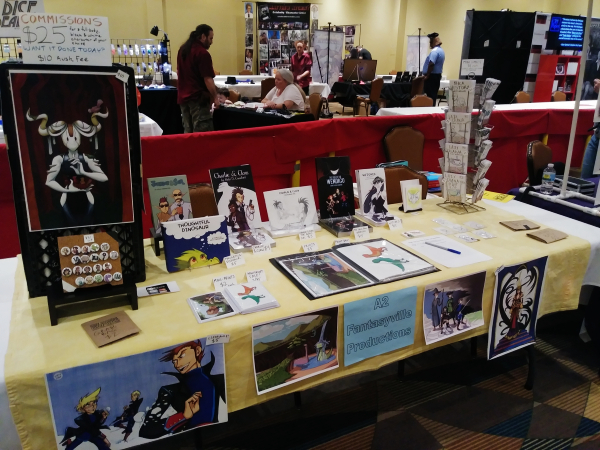 Also, Arcanineryu will be at the show, as well, so be sure to stop by her table, as well!